Store bought gnocchi with a simple rose sauce. Definitely not low cal, but it can be ready in minutes! Boil water in a medium sized pot and cook gnocchi according to packaging instructions. In a separate pan, add 1 tbsp. olive oil and pressed garlic over low heat. Add tomato sauce and heat. Stir constantly until it is a rose color. 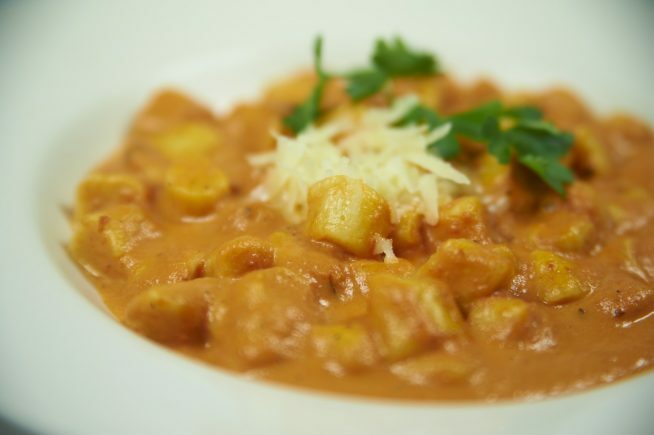 Toss strained gnocchi with the sauce.